Last week the keepers at London Zoo were busy counting their 17,000 animals, as part of the annual headcount. Knowing numbers is vital within the wild too, but counting animals on the plains of Africa is more challenging. Traditionally wild counts are either ground surveys, which take people and time; or aerial surveys, that can spook the animals. Satellite remote sensing could offer a potential solution, but it’s not straight-forward. Three papers published in 2014 show the possibilities, and challenges, of using satellites to count animals. 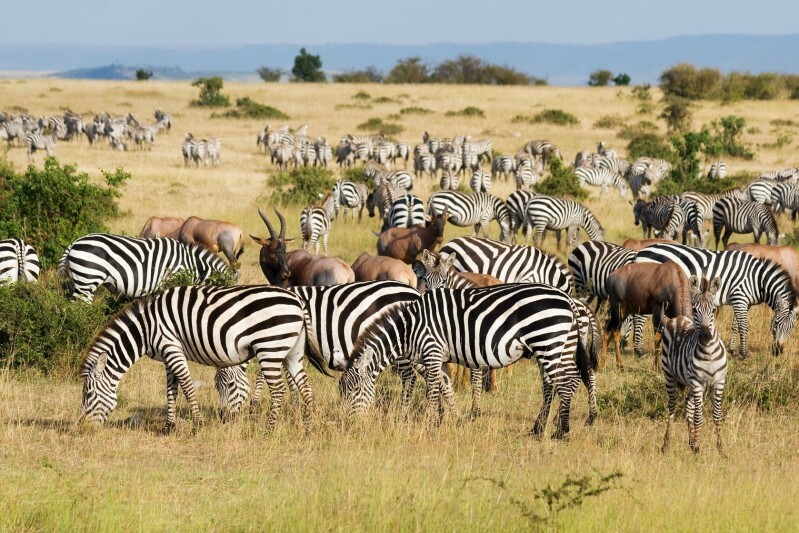 The paper Spotting East African Mammals in Open Savannah from Space by Zheng Yang et al (2014) published on the 31st December, describes the use of very high-resolution GeoEye-1 satellite images to detecting large animals in the Maasai Mara National Reserve, Kenya. GeoEye-1’s 2m multispectral image resolution was not sufficient to detect large animals. 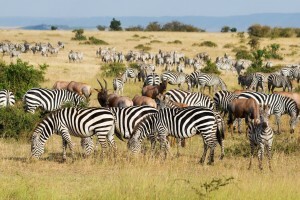 However, when combined with the panchromatic image using a pan sharpening technique the resolution improved to 0.5m meaning adult wildebeests and zebras were 3 to 4 pixels long, and 1 to 2 pixels wide. Experienced Kenyan wildlife researchers initially visually reviewed images to develop a classification system, forming the basis of a hybrid image system, using both pixel-based and object-based image assessment approaches to determine which pixels belonged to animals. The results showed an average count error of 8.2% compared to manual counts, with an omission error rate of 6.6%, which demonstrates that satellites have potential for use in counting; it’s cheaper and less intrusive than existing methods. The second paper was published by Seth Stapleton et al (2014) entitled Assessing Satellite Imagery as a Tool to Track Arctic Wildlife. It used 0.5m resolution imagery of Rowley Island in Foxe Basin, Canada, from Worldview-2 to monitor the island’s polar bear population. The images were corrected for terrain and solar irradiance, and an a histogram stretch to brighten darker, non-ice, areas to assist human analysts identify the bears. Two observers visually identified ‘presumed bears’ both individually and jointly; resulting in the identification of 92 presumed bears. This satellite derived figure was consistent with other models, again offering a potential cheaper and safer way of monitoring polar bears. Finally, Peter Fretwell et al (2014) published Counting Southern Right Whales by Satellite. Also using WorldView-2, they used a 2m resolution image with eight colour bands and one panchromatic band. The images were analysed using ENVI5 and ArcGIS to identify potential and probable whales, and then visual inspection of these images showed they had identified objects of the right shape and size to be whales; resulting in the identification of 55 probable whales and 23 possible whales. Again, showing satellite images could be useful in calculating whale populations faster and more efficiently. Resolution: Currently available resolutions may not sufficient to distinguish the level of detail conservationists need, such as species identification in Africa or polar bear cubs in the Canada. However, it may be possible with very high resolution satellites such as the planned WordlView-4 from DigitalGlobe. Cloud cover: The persistent nemesis of optical Earth observation imagery may hamper it’s use in certain areas or seasons. Complicated environments: Further research is needed to ensure animals can be accurately distinguished from their surroundings. Despite these reservations, the potential to offer regularly, more efficient and safer methods of survey animal populations from space means this will be a rapidly developing area of Earth observation. This entry was posted in Data, Earth Observation, Education, Remote Sensing, Research, Space Can Help, Space Industry, Understanding Space, visualisation and tagged Arctic, counting animals, DigitialGlobe, Earth Observation, GeoEye-1, Maasai Mara National Reserve, pixalytics, polar bear, Satellites, Space, spatial resolution, whales, wildebeest, Worldview-2, zebra by Andy. Bookmark the permalink.